With fall chill coming his is a quick soup to warm your bones. In medium saucepan, bring chicken broth, kale, and garlic to boiling. 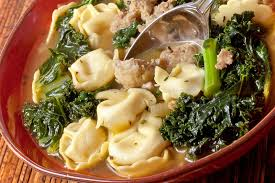 Add tortellini and cook according the package directions until tortellini is tender but firm. For last 2 minutes of cooking time, stir in green onions. Serve with Parmesan cheese. Serves 5.